We have added Crochet to my Holiday Bake Craft Sew Series. 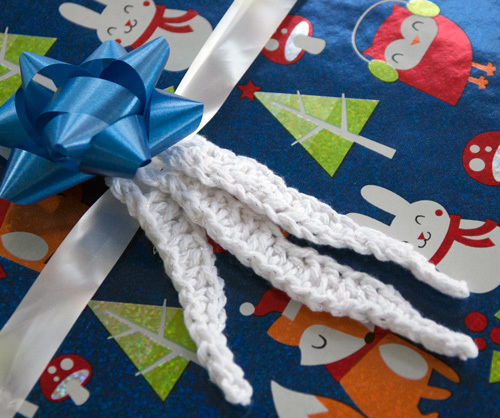 Thirty amazing bloggers will be sharing crochet tutorials perfect for holiday gift giving. Be sure to head over to Your Homebased Mom for loads of edible gift recipes and Thirty Handmade Days will help us craft the perfect handmade holiday.By the end of the month we will have shared over 100 fabulous handmade gift tutorials. We even have some incredible giveaways. Each day be sure to visit the guest poster’s blog for a chance to win BIG! So today you will want to head over to Moogly Blog for a chance to win a $300 Michael’s Gift Card. Yes, $300! Can you imagine all the yarn you could buy! Thank you so much to Skip to My Lou for letting me guest post here today! There might not be icicles hanging from the eaves just yet, but they’re a sparkly sign of the winter holidays! 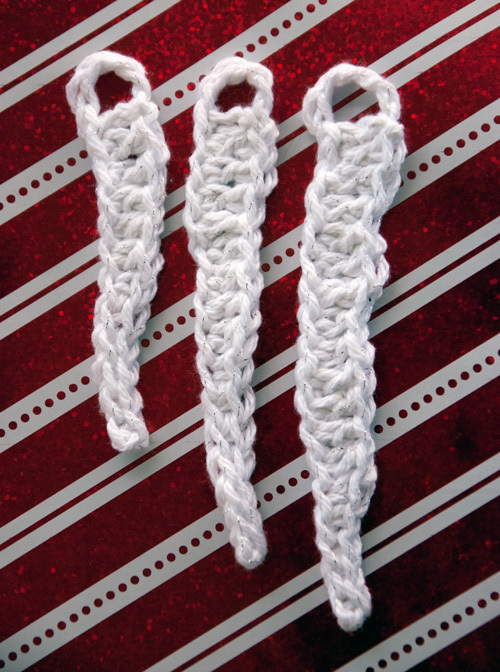 These 3 one round icicle crochet patterns make great gift toppers for sprucing up your pretty wrapped packages – and can decorate the tree for years to come! Made with soft sparkly yarn, they’re easy enough for the beginning crocheter to make, and safe enough for even the youngest ice princess to decorate with! Icicle #1 (shortest): Ch 6, join to first ch with sl st to form a ring; ch 12, skip ch closest to hook, sl st in next 3 chs, sc in next 3 chs, hdc in next 3 chs, dc in last 2 chs; sl st into ch-6 ring, break yarn and finish off, weave in ends. Icicle #2 (medium): Ch 6, join to first ch with sl st to form a ring; ch 16, skip ch closest to hook, sl st in next 3 chs, sc in next 4 chs, hdc in next 5 chs, dc in last 3 chs; sl st into ch-6 ring, break yarn and finish off, weave in ends. Icicle #3 (longest, a little lumpy): Ch 6, join to first ch with sl st to form a ring; ch 18, skip ch closest to hook, sl st in next 3 chs, sc in next 2 chs, hdc in next 2 chs, dc in next 2 chs, hdc in next 2 chs, dc in next 2 chs, hdc in next ch, dc in last 3 chs; sl st into ch-6 ring, break yarn and finish off, weave in ends. I think you get the idea! Quick, easy, and fun! Feel free to play with the pattern and make up your own icicle shapes – straight or wobbly, long or short, they’re a great way to share your crochet with everyone on your list – and enjoy a handmade holiday! Looking for other gift topper and ornament ideas? Check out the free Glittery 2 Round Stars and Christmas Tree Coffee Cozy patterns on Moogly! 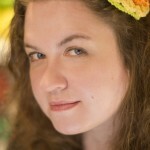 Tamara Kelly is the designer and blogger at Moogly. 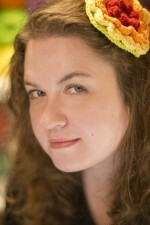 Tamara has been crocheting for over 12 years, and designing since 2011. On Moogly you’ll find over 160 free and original crochet patterns, as well as award winning HD video tutorials and pattern collections, giveaways, and more! You can get more Moogly in your life on Facebook, Twitter, Pinterest, and in your inbox with the free weekly email newsletter – come join the fun! When I received a baby blanket for my son made by my Grandmother.